“Fishing stocks represent a significant natural resource for African coastal communities,” according to Ambassador Mary C. Yates, civilian deputy at United States Africa Command. In many regions of the world fish have long been a cornerstone of local livelihoods. But burgeoning population growth and overfishing are devastating fish stocks, exacerbating local grievances and contributing to conflict and regional instability. In a recent interview with David Axe, a military correspondent with Wired Magazine’s Danger Room, Axe said that in East Africa fish are obviously “tied to conflict.” In Somalia, for example, instability left the country, a once prominent and vibrant fishing economy, in a “sort of a free-for-all” for any country or private company to “plunder those waters illegally” and unsustainably. “That’s been one of the root causes of piracy,” Axe said. Since 1991, the Somali government has been too weak and ill equipped to protect fishing interests, forcing many fishermen to seize illegal trawlers on their own and sparking vigilantism that has evolved into the pernicious piracy that plagues the Gulf of Aden today. According to Reuters, Nile perch stocks have dropped more than 80 percent in the three years, threatening an industry worth hundreds of millions of dollars. Uganda alone generates more than $100 million annually from exporting Nile perch. However, decline in fish stocks has forced Ugandan fish factories to reduce processing by up to 75 percent. Meanwhile, more than 30 million people living on Lake Victoria rely on the lake’s natural resources for survival. As resources become scarcer, the issue may compound existing grievances between Uganda and Kenya and spark conflict. However, even if war does not erupt, it is important to understand the way in which access to fish will engage other existing grievances in Kenya and Uganda – two states that are ranked 14th and 21st on Foreign Policy’s “Failed State Index,” respectively – and contribute to instability. The United States has already had to engage in Somalia – a completely failed state – where the U.S. Navy has recently taken command of the Combined Joint Taskforce 151 off the Horn of Africa to combat piracy, which has clearly become a threat to global commerce and security, and has its roots in part in over-exploited fish resources. On Friday, the U.S. Department of State concluded negotiations on the “Agreement on Port State Measures to Prevent, Deter and Combat Illegal, Unreported and Unregulated Fishing,” a new draft United Nations' treaty aimed at combating illegal fishing, making it clear that the United States is looking at the challenges of over-exploited fish. But how will these issues present strategic challenges to the U.S. military? Stability in East Africa is of course of high strategic importance to the United States, as a home to al Qaeda activity, ungoverned spaces, and a large youth population. In March, the Los Angeles Times reported that U.S. military intelligence fears that al Qaeda’s Somali network may be “forming terrorist cells to hit targets in Europe and the United States.” The situation is especially alarming in Kenya, where al Qaeda has already had a presence for some time, and where Fazul Abdullah Mohammed, al Qaeda’s East Africa operations chief, had been hiding until August 2008 when an unsuccessful raid drove him underground. Meanwhile the Combined Joint Task Force-Horn of Africa (CJTF-HOA) provides support to East Africans “to counter violent extremism” by strengthening “partner nation and regional security capacity to enable long-term regional stability,” including in Kenya. These examples make clear that resource issues in East Africa connect with many of the challenges the United States is already facing there. And fish might be the foremost among them in the near future. 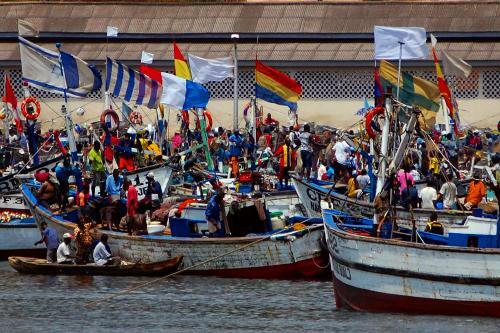 Photo: Fishing boats in Ghana, where U.S. Africa Command has been conducting combined training exercises with Ghanaian maritime forces to bolster their capacity to patrol their waters and protect fisheries from illegal trawlers. Courtesy of Vince Crawley and U.S. Africa Command.